“White Lightning,” my stone ermine, was recently juried into the Wildlife Experience in Art Show and Sale. The show runs from September 28, 2013, through January 5, 2014, at The Wildlife Experience, 10035 Peoria, in Parker, CO. 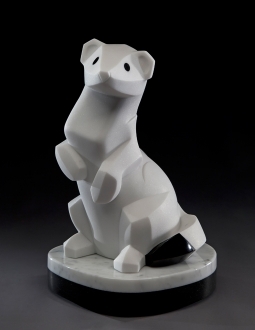 The ermine is the winter coloring of the stoat, here carved in Greek marble. The show opening, Wildlife Art and Wine, will be Saturday evening, September 28, and will feature the juried artwork of artists from 5 Rocky Mountain states. Wine from 20 vendors in the west and live music will also be featured. The museum and grounds are beautiful, many of the artists, including myself, will be present. This promises to be a lovely event. As befits the setting, the art is all wildlife, no domestic animals. The show is sponsored by The Wildlife Experience and Rocky Mountain Animal Artists. I hope to see you there!